Remember that old public service ad with a father confronting his son about drug use? Asked where he learned to do such things, the son replies, "You, all right? I learned it by watching you!" A similar process applies to self-censorship. When those in positions of power and authority succumb to the temptation of muzzling their own speech out of fear, is it any surprise that the less powerful often follow suit? Consider the case of Molly Norris. After threats prompted Comedy Central to censor Muhammad in the April 21 episode of South Park, the Seattle-based artist took a stand for free speech. Norris created a poster announcing "Everybody Draw Mohammed Day," sponsored by the made-up Citizens Against Citizens Against Humor. Imploring people to sketch the prophet on May 20, the image features good-natured doodles of a teacup, a domino, and other items claiming to be his likeness. "As a cartoonist I just felt so much passion about what had happened [that] I wanted to kind of counter Comedy Central's message they sent about feeling afraid," Norris explained in an interview. Yet as her idea raced around the internet, taking on a life of its own, she had second thoughts. Norris composed a note distancing herself from the event, declaring that she "never wanted or committed to leading a 'movement,'" and arguing that enough cartoons of Muhammad have been drawn to "get the … point across by now." She even defaced her original poster with comments such as "Lighten up! This is a fictional cartoon!" while assuring us that the teacup, the domino, and their friends are not actual representations of Muhammad. Elsewhere she admitted, "I am personally afraid of Muslims because the peaceful folks of that religion do not often come forward to differentiate themselves from any radical elements!" Well, that much is true. So how should lovers of liberty react to Norris? With disappointment, perhaps, but not with anger. After all, when a prominent network like Comedy Central — which could afford to pay for whatever security it and the South Park creators need — caves to a small cadre of goons, what message does it send to someone whose only protection might be a deadbolt? The answer: that self-censorship is an acceptable response to Islamist intimidation. The lesson gets reinforced over and over: Citing safety concerns, Yale University Press balked at including the Danish Muhammad cartoons in a 2009 book about — yes — the Danish Muhammad cartoons. Then images of the prophet were pulled from New York City's Met. 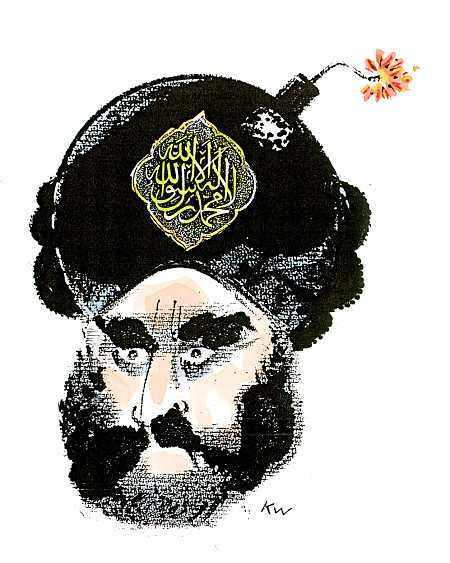 In February, the Danish newspaper Politiken apologized for offending Muslims by reprinting Kurt Westergaard's bomb-in-the-turban caricature. Westergaard himself is deemed too dangerous to associate with, having had a charity illustration refused and a talk show appearance canceled. Lars Vilks, known for living in a booby-trapped house after drawing Muhammad as a dog, is becoming persona non grata as well. In short, Norris and others "learned it by watching you!" Media outlets that self-censor produce citizens that self-censor. Because free speech is absolutely vital to beating back the storm surge of Islamism, readers are encouraged to contact Viacom, the owner of Comedy Central, and educate it about civic responsibilities in the age of jihad.